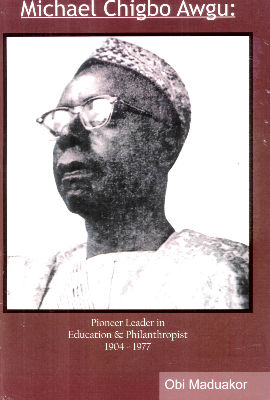 This captivating biography of Chief M. C. Awgu (1903-1977) written by Professor Obi Maduakor celebrates the life and mission of a Nigerian pioneer leader in education during the difficult days of colonial Nigeria when opportunity for education was severely limited. Chief M. C. Awgu had the vision to foresee the role that education could play in fostering human and national development. He therefore established schools in the 40s and the 50s to give the youths of the nation an opportunity for self-improvement through education. He founded New Bethel Primary School Onitsha in 1940, New Bethel College Onitsha in 1942, and Basden Memorial Grammar School Isulo in 1959. What was unique about Chief Awgu was his scholarship scheme for indigent students which he called “the pay-back-after-graduation” plan which gave free tuition to indigent students in exchange for mandatory teaching service in his schools after graduation. The Nigerian Civil War intruded into Chief Awgu’s private-school education initiatives. Dr. Obi Maduakor taught English for many years at the University of Nigeria, Nsukka, as full Professor and was a one-time Visiting Professor at the University of Guelph. His expertise is in English, African and Caribbean literature, Modern Literary Theory, and Poetry. Dr. Maduakor has been the recipient of numerous academic honours as Visiting Professor and Visiting Fellow, and is listed in ‘Two Thousand Outstanding Academics of 21st Century’ by Cambridge International Biographical Centre, 2004. He is currently English Professor at Seneca College, in Toronto. He is also an evangelical Anglican priest under the jurisdiction of Enugu Diocese, Nigeria, and Anglican Network in Canada, ministering as Honorary Assistant at St. Chad’s Anglican Church in Etobicoke, a suburb of Toronto. He enthusiastically combines his academic work with his calling as priest. Purchasing the Book: To purchase this book, send an email to the editor at editor@newnigerianpolitics.com. We will be happy to forward instructions on purchasing options.